February 1, 2016 By Chelsea T.
February has arrived and couples everywhere are starting their Valentine's Day preparations. Instead of the traditional candle light dinner, movie or basket full of chocolates and stuffed animals, why not give your Valentine an experience they'll never forget (even if they want to!) There are Haunted Houses right here in New Jersey that are offering special Valentine's Day themed events all weekend long, check them out below and be sure to purchase your tickets before they sell out! Treat your Valentine to a unique experience this year at Haunted Scarehouse! This is an optional contact event, if you choose to wear a glow stick, you will get touched by the creatures that await you. You'll be trapped inside escape rooms, forced to work together with your sweetheart to find clues and solve puzzles to get out alive! Tickets include all three events: Trapped: Escape Games, The House of Nightmares and Blackout: The Attic. Click here to purchase tickets in advance. Enjoy a unique Valentine's Day experience at Brighton Asylum's Dark Valentine event! You must be 18 or older to attend or under 18 with a parent//legal guardian and willing to sign a waiver. 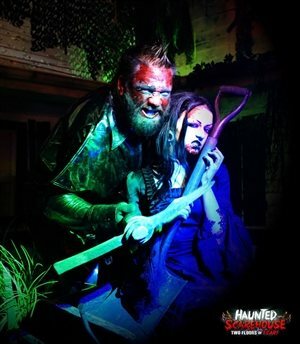 The haunted attraction will take place from 8:30-10:30 PM both nights and is sure to impress your Valentine by creating a night they'll never forget! Click here to purchase your tickets ahead of time!